Our last stop in the US was Houston. We had a whole day to kill before our flight, so we found the best place to wait – in the 160 acres of the beautiful Buffalo Bayou Park. We handed back the Mazda 3 and said farewell to the USA at Houston airport as we boarded our EVA Air flight to Tokyo, Japan. The phenomenal saving on airfares cancelled out the pain of a 16 hour flight, followed by a 9 hour stopover in Taipei and another 3 hour flight to Tokyo Narita airport. Just. EVA air, Taiwan’s national carrier, was an interesting choice. Sadly we didn’t get to fly on any of the Hello Kitty fleet, which looked absolutely crazy, but we were treated to some surprisingly tasty oriental-style plane food instead. The only thing we couldn’t stomach was the congee (Chinese style porridge) topped with minced pork for breakfast. We did our research for our stopover at Taipei’s Taoyuan International Airport and went to find the free showers to make us feel human again (Terminal 2 baggage area, just behind carousel no. 6, if you are ever in the area). Bring your own towel though. Who needs to pay for expensive airport lounges? 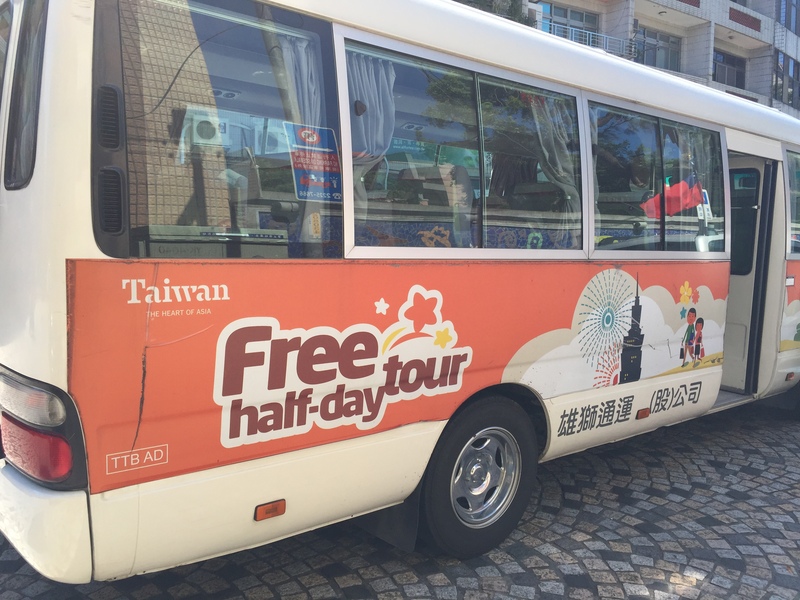 We’d heard about free half-day city tours organised by Taiwan’s Tourism Bureau and, rather than face sitting in another soulless airport for 9 hours, jumped at the chance to see some of Taiwan. At the very least it was a bonus country to tick off our list! We booked on the tour at the Tourist Service Centre desk at arrivals. The morning tour runs from 8am – 1pm and is on a first-come-first-served basis for transfer passengers with 7-24 hour layovers before their next connecting flight, who have a valid R.O.C visa or are from a visa-exempt country (the UK is visa exempt). We were in a small group of about 10. We met a German couple on a 19 hour stopover to Auckland (which made our journey seem a small jaunt), some Americans, and a traveller from Indonesia. 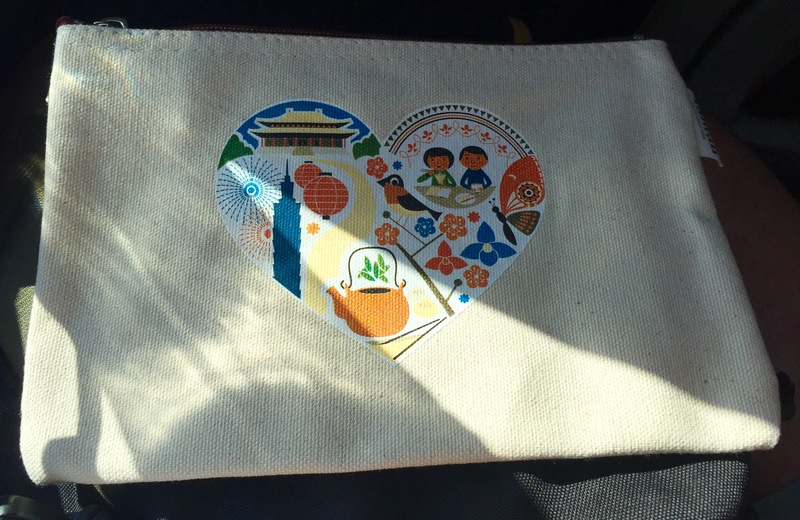 Phil managed to win a free make-up bag (made in Taiwan, obviously) for answering a question about Taiwan correctly on the tour bus as we set off. Thanks Phil! 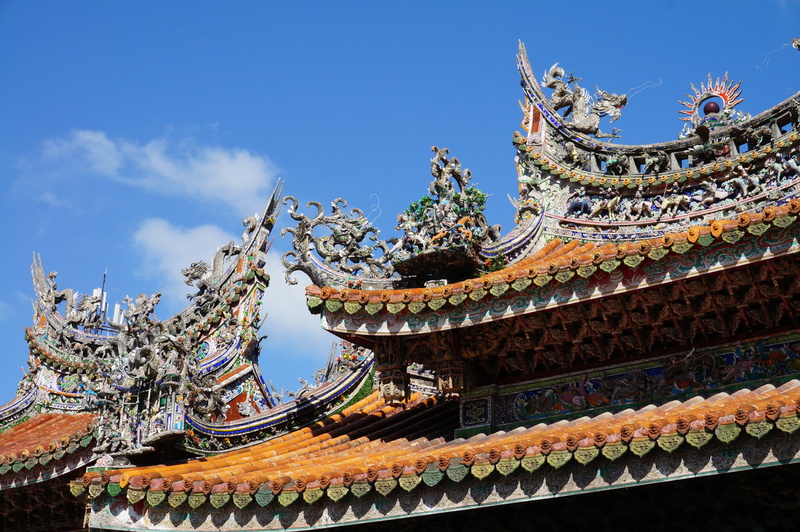 We went to Zushi Temple in Sanxia, an old town about 22km southwest of Taipei. Our tour guide, who spoke great English, helpfully explained some of the basics of Buddhist temples to us. Each entrance usually has two lions, the male on the left (order of precedence; in Eastern culture the left favours the right) and the female, usually protecting her cubs, on the right. It’s important to never stand on the doorway ledge; always step over it, and enter the temple on the right, exiting from the left. We went to Yingge Ceramics Museum, “showcasing 200 years of ceramic evolution and folk culture in Taiwan” (newly opened by the government, so an obvious choice for the Tourism Bureau). It wouldn’t usually be our sort of place to visit but we had a quick look around and a delicious mid-morning milk bun and cup of coffee. There were lots of school children who were very excited to practise their English, so we had a lot of hellos and waves. Then it was back on the tour bus, where we were taken to Yingge old town where we had chance to look round the pottery shops and take tea. 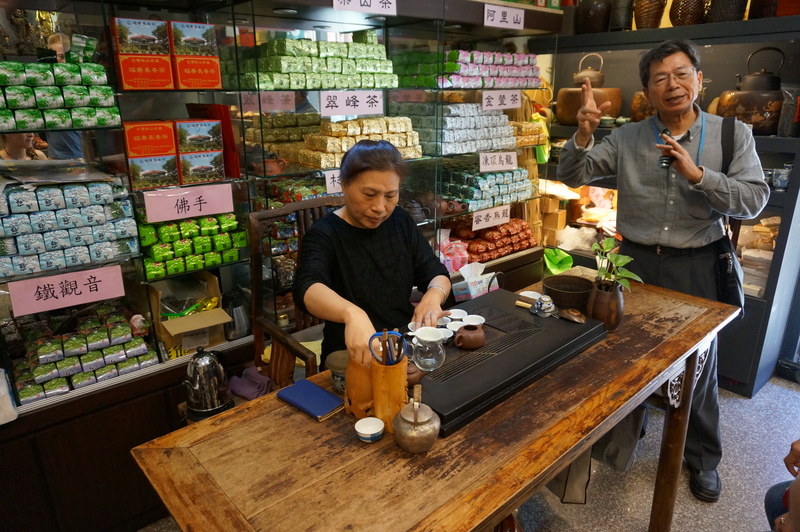 Tea making in China and Taiwan is more complex than our method of boiling the kettle, and it was interesting to have the process explained to us by our guide and taste some Taiwanese Autumn tea. 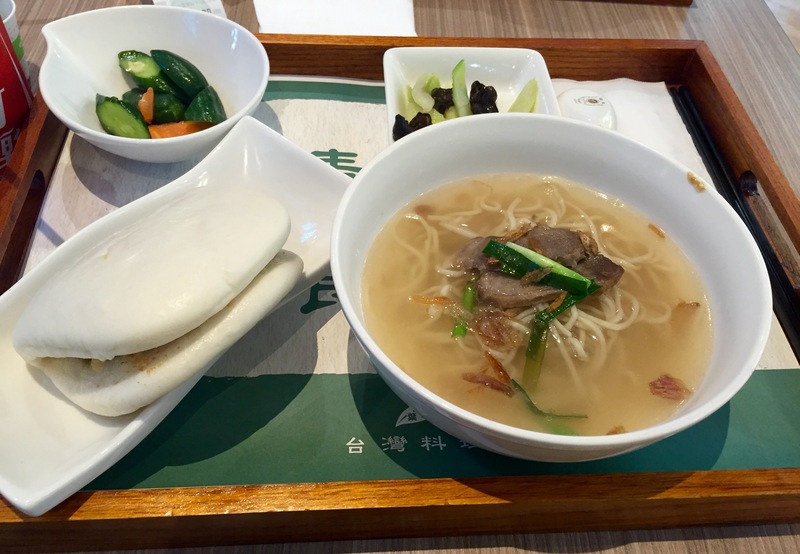 We arrived back at the airport in good time and had a late lunch of belly pork steamed bao buns, pickled cucumbers and chicken noodles. 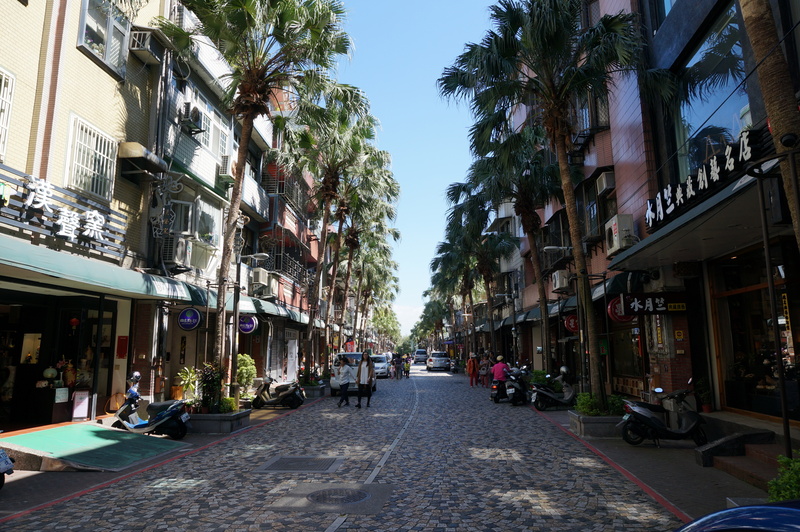 The short trip was a great introduction to Taiwan and whilst we waited for our final flight we found ourselves googling Taiwan, its complex relationship with China, and its beautiful sandy beaches – with its tropical climate it looked like a place we could spend more time in. Maybe on another trip! More airports should offer these free sightseeing tours – we found ours via a blog, Thrifty Nomads. If you ever have a long stopover it’s worth investigating what your airport offers – often it’s more than just duty free shops and Starbucks.